Every year at this time, friends and family start asking me what I think will be the hottest products at CES. There are so many this year, I don’t know where to start. I will be reporting from the show floor so expect to relay the greatest innovations as I find them. 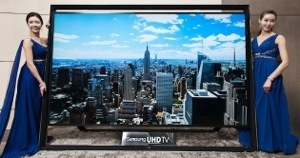 I do expect a lot of attention on Samsung’s new 110-inch TV. The 110S9 features an ultra high definition (UHD) 800MP display. According to Samsung, the 110S9 will be targeted to high-end consumers in China, Europe, and the Middle East. Expect the unit to be sold here midyear. The 110S9 can be customized to individual consumer needs. Industry sources said the unit is priced at over $150,000, although no one knows for sure. Samsung said they expect orders from companies, governments, and other enterprise customers before households. This entry was posted in digital, senior lifestyle, tech and tagged 110-inch display, Samsung by loiswhitman. Bookmark the permalink.